This chapter demonstrates how leadership behaviour has historical links to organisational change brought about by macroeconomic and technological advancement. The eighteenth century witnessed the steam age revolution that led to the growth of centralised work and patriarchal leadership behaviours (Industry 1.0). The early twentieth century saw the discovery of oil and electricity to drive machinery and steel production, resulting in organised work and transactional leadership (Industry 2.0). The mid to late twentieth century heralded the computer, data, and digital age that decentralised the workplace and produced relational leaders (Industry 3.0). 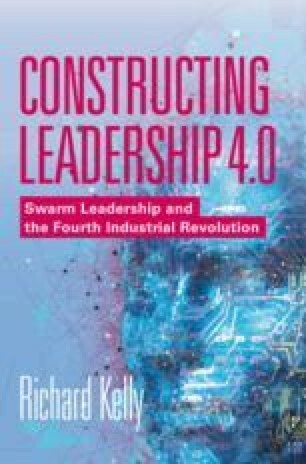 The chapter concludes with five major technological advancements—connectivity, transhumanism, machine intelligence, data-ism, alternative energies—that are connecting consumers together in unique ways and changing customer behaviour and organisational decision-making towards networked collaborative ecosystems and swarm leadership (Leadership 4.0). The chapter concludes that future leaders will need to be developed in different ways to prepare them for this new organising reality.